I have three favourite crabapples. Purely for spring beauty, I adore Malus ioensis ‘Plena’. This ornamental variety doesn’t produce proper fruit – it blows everything in its arsenal on a marvellous display of bright pinky-red buds that open to pale pink spring blossoms. But for fruit, I think ‘Jack Humm’ and ‘Jelly King’ are the perfect pair. ‘Jack Humm’ has masses of vibrant red fruit, so vibrant that they look like those small fake red apples sold as Christmas decorations. The fruit is slightly oval in shape, and just utterly, utterly beautiful in autumn. ‘Jelly King’ isn’t quite as spectacular but, as its name suggests, its blushing orange/red fruit make lovely crabapple jelly. It’s absolutely prolific and the birds tend to leave the fruit alone until quite late in autumn. But, more importantly, I like ‘Jelly King’ because it’s perfect for making teeny tiny toffee apples. I made a batch of them today in between stirring the quince paste and scooping feijoas into jars to preserve. Toffee apples are never as nice as you think they’re going to be. Not just because you end up with sticky gloop all over your face, but because the toffee’s generally too sweet to eat in such a large dose, and the apple is invariably all soft and mushy underneath. Which is where the crabapple really comes into its own: crabapples are crisp,tart and utterly terrific-tasting with a coat of toffee. To make a dozen toffee crabapples, wipe the fruit, twist out the stalks and cut out the little hard bit on the base of each apple. (I’m sure there’s a technical horticultural term for this but blowed if I can think of it right now.) Then press a kebab stick into each apple. We purchased a property with beautiful old trees and there are three crab apples and the flowers in Spring were mind blowing so I suspect that this is what you are referring to. There is fruit on them now, but they are very small but suspect that they will get bigger?? Can all Crab Apples be used for crab apple jelly or are some ornamental only and purely for show. Love the recipe idea to use crab apples I had the same recipe for small apples but never managed to find really small ones so a great idea – why are crab apples not sold in the fruit and vege shops…where could you buy them? I made my quince jam today after seeing that you were going to do it! All crabapples have beautiful blossoms, but some of them don’t fruit so well. You can expect fruit the size of large cherries. Yes, all varieties can be used for crabapple jelly (if you can beat the birds to them). I guess the fruit isn’t sold in the shops because they’re too tart to eat fresh. Unless you have a really, really sour tooth… though I suspect that, given how trendy the whole foraging scene is these days, someone will probably have them to sell at local farmers’ markets. One hypo baby in production eh? I’m not sure how far through your pregnancy you are Lynda, but I just don’t know how you have the energy for all this industrious undertakings, especially after all the wedding preparation! I think I must have wasted too much time lying on the couch when I was pregnant 😉 By the way, how do you go about bottling feijoas? Thanks for the tips. Completely understand the bottling over cupboard cleaning. I’m a baker really, and I’d much rather bake than do most other things. Good luck for the next 9 weeks. Rest is good now, I got the puffy feet too and it wasn’t much fun – so take care. Baking is good fun; I made a feijoa cake yesterday with lemon icing… I promise I’m not eating everything I make! Hi, on a totally different subject… I have been potting up strawberry runners for our move north to Pukekawa, and I remember hearing that you should only use the first runner closest to the plant, have you heard this story. Also I met you at a Stephanie Alexander lunch awhile back and you said your parents had fruit trees close to Pukekawa. Do you know what grows well there? Could I grow Cherimoya and almonds,macadamias etc? I’ve never heard that (which isn’t to say it’s not true). Generally the first runner is the best one just because it has had the longest to put down roots. As for fruit trees that do well in Pukekawa, it really depends on how frosty your place is. Cherimoyas are subtropical, ditto macadamias (though both will grow if you protect the young trees for a couple of years). Almonds like winter chill so they’ll be fine, and it’s not too cold for citrus, and most deciduous fruit trees (plums, apples, pears etc) do well. Peaches are a bit hit and miss because of the summer humidity, but to be honest, trial and error’s the only way to find out. Good luck! Hi Lynda.. I hope all is going well for you both with your darling wee Babe.. and it’s lovely to read your articles in the Gardener magazine. I have a question.. I’m working on the menu for my Daughter’s 21st next month, and dessert will be birthday cake and other finger-food type goodies – Jennifer Square (which carries her name), Marshmallow shortcake, Lamingtons, little patty-pan sized blackberry and apple crumbles, using a short pastry base, apples and blackberries from my garden, then her favourite crumble topping – she created the recipe over time by trialling lots of options. 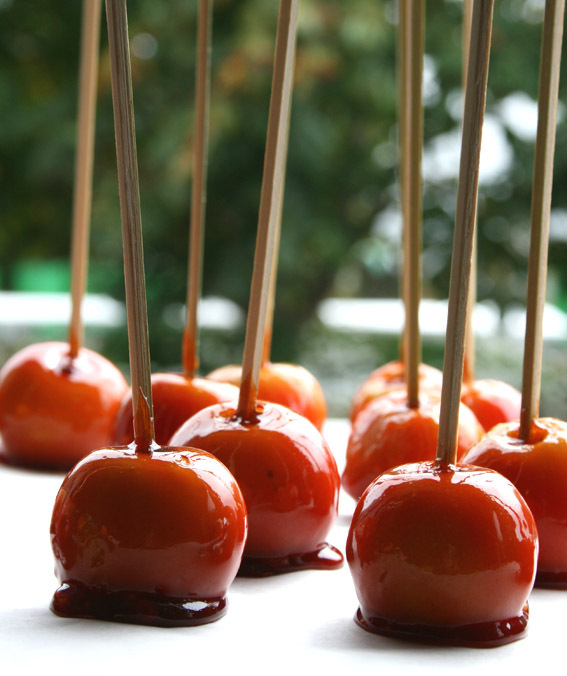 She purchased and enjoyed a toffee apple recently (sold at the White Cross Orchard at Awakeri, just inland from here in Whakatane)- and I’ve decided to make some to include as part of the dessert, as one of the surprises she’ll have that night. I’ll have pieces of apple about the same size of two bites, pushed onto toothpicks and will use your recipe – thanks for sharing it above. My question is, how far ahead could I make them – the party is on a Saturday night – could I make them 2 to 3 days prior to that? And if so, keep them in the fridge or airtight container, or??? Hate to say it but you really need to make them on the day if they’re to taste any good, as the apple goes soft otherwise, and the toffee tends to go all sticky if there’s even a slight hint of humidity in the air. You can put them in the fridge, but when you take them out, the toffee gets a sticky film on it. You can wrap them in plastic wrap but that is a nightmare for everyone to peel off prior to eating. Having said that, honestly, they only take 15 minutes to make. What date is the party? Do you want some crabapples? Sounds like you’ve got a cute menu! Her party is on Easter Saturday, 23rd April.. would you still have them then?? And if so, please let me know about the cost and p&p so I can send/transfer the funds to you.. thanks..
You’ll have my email address with this to contact me to let me know..
Hi There, Just been making a Croqembouche,ans making the toffee. I was wanting toput a lovely ball of spun sugar on top, but couldn’t manage and fine stringy toffee, so i used shards of toffee to decorate. Two questions, how do i get the toffee to spin & 2nd, what is the effect of vinegar in toffee?, why couldnt just use sugar & water?